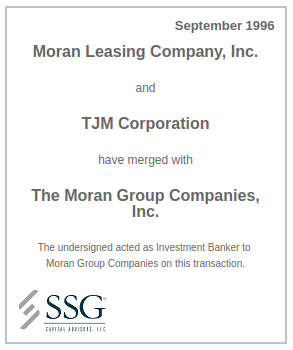 The Moran Group Companies Inc.
Moran Leasing Company, TJM Corporation and The Moran Group Companies, Inc. were all involved in various niche printing businesses. All three companies had their own group of shareholders with some shareholder overlap between the three companies. The three companies were looking to combine their operations in order to effectuate a global refinancing of all three operations. SSG was retained to provide an independent valuation of all three companies and assisted in completing the overall merger.